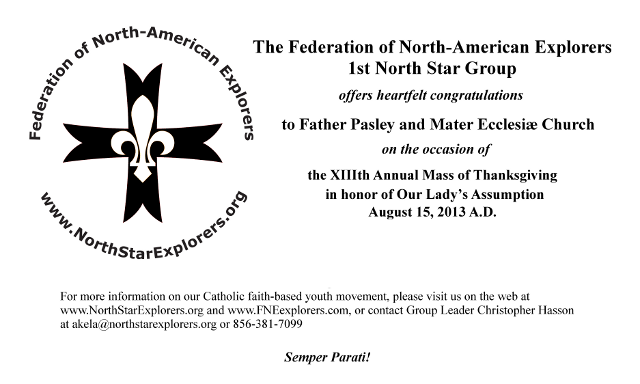 2013 August | Federation of North-American Explorers | Semper Parati! With our general commissioner’s approval, we are pleased to announce and welcome the 1st Fr. Emil Kapaun FNE St. Maximilian Kolbe Otter Lodge, Timber Wolf Den, and Explorer Troop in Wichita, Kansas, and the 1st Stella Maris FNE Our Lady Star of the Sea Otter Lodge, Timber Wolf Den, and Explorer Troop in Miami, Florida to our FNE family! More announcements to come with our developing groups so stay tuned! Please see our Podcasts page for this new podcast, featuring our North Star Timber Wolves who were able to make the trek to Camp Endobanah this year.